Get the Blueprints to the Signature Starfighter of the Galactic Empire! The TIE/LN Fighter™ is one of the most maneuverable and effective Starfighters in the galaxy. Able to fight in space and in planetary atmospheres, the versatile TIE/LN fighter is an ever-present reminder of the Empire's power. The workhorse of Imperial fighters, this compact killing machine measures 7.24 meters in length, and can attain a top end speed of 1,200 kph. The 2017 TIE/LN Fighter™ $2 1 oz. Silver Proof is the fourth ship to be added to the Star Wars Ships coin collection. This unique, colored and engraved coin features part of the design blueprint for the TIE/LN Fighter, which became an unforgettable symbol of the Imperial fleet. This impressive coin is produced by the New Zealand Mint, known for its high-quality designs and craftsmanship. Fourth Release in the Series– The TIE/LN Fighter is the fourth ship to be added to the Star Wars Ships coin collection. Struck in 99.9% Pure Silver– Each TIE/LN fighter coin is struck in 1 Troy ounce of 99.9% pure silver over a diameter of 40 millimeters. Proof Condition– Manufactured using highly polished planchets and struck multiple times creates its mirror-like Proof condition. 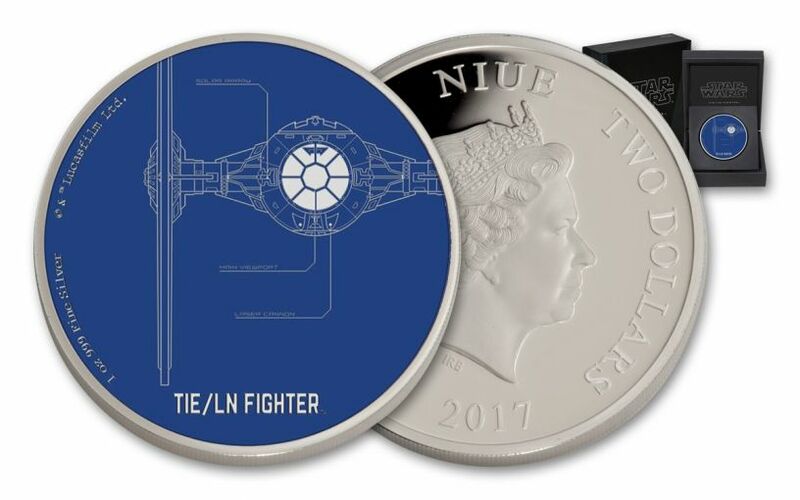 Niue Legal Tender– The 2017 TIE/LN Fighter™ 1 oz. 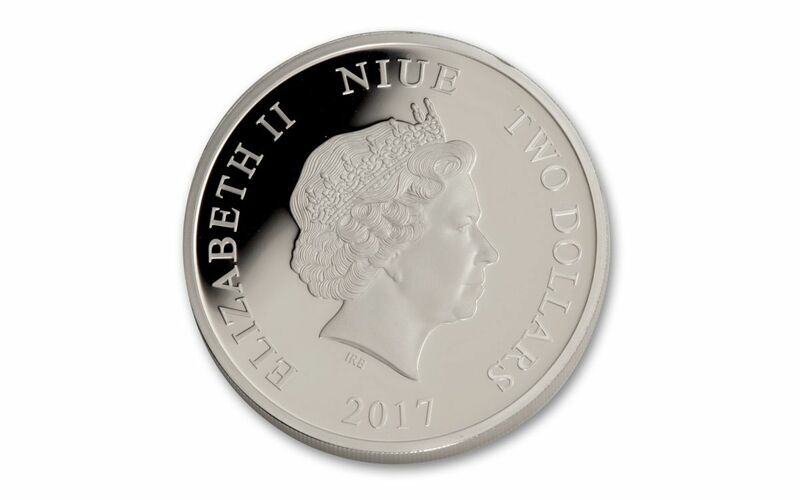 Silver Proof is $2 legal tender, as reflected in the inscription on the obverse of the coin along with the effigy of Queen Elizabeth II. 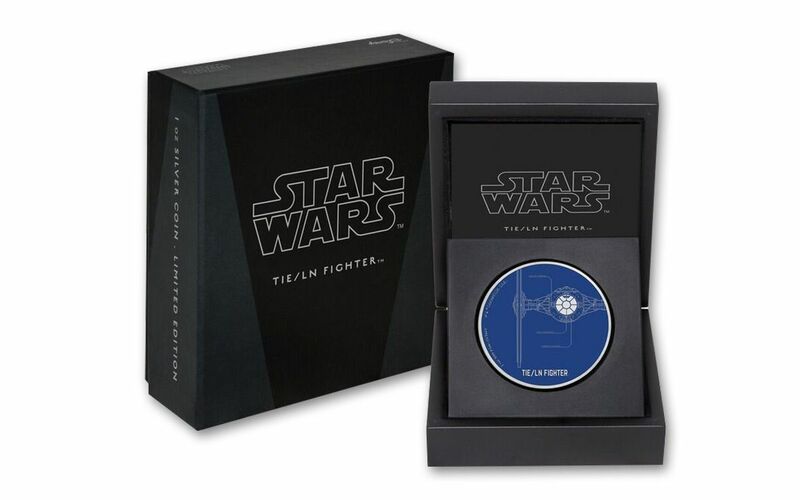 Star Wars™ Branded Packaging – The coin comes presented in a high-quality inner coin case and Star Wars branded outer packaging, making for an impressive display. The Certificate of Authenticity sits within the coin case. Coupled with a worldwide limited mintage of just 10,000 coins struck, this coin is sure to be popular with fans and collectors worldwide. Don’t delay as these are sure to fly out of stock at light speed. Order yours today!